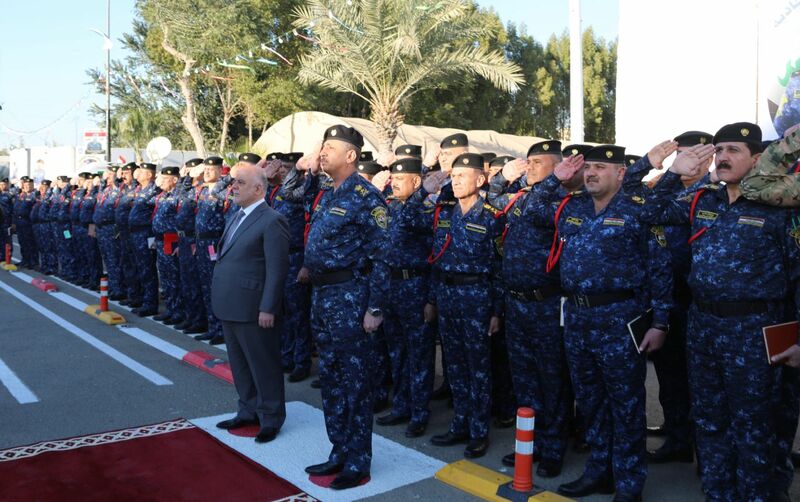 His Excellency Prime Minister, Commander-in-Chief of the Armed Forces Dr. Haider Al-Abadi has confirmed that the government has new challenges after eliminating terrorism, which is to protect the security of cities and citizens from terrorist's cells that is by Intelligence we will face it, as well as organized crime, the smuggling of arms, drugs and others. "You did teach the enemies a lesson they will not forget," his Excellency has said. "You did mark the best examples in dealing with terrorism". Dr. Haider Al-Abadi has said that the enemy was broken and we did achieve victory on the ground, psychologically and ethically through your kindness to citizens and human rights, protecting the elderly and IDP's, sharing with them your food and water. His Excellency has praised the tremendous development in the capacity of the federal police, noting that it did unify with the rest of the security forces' formations of the country, it fought side by side with the military, Popular Mobilization Units, Tribal units and Peshmerga, and it did make sacrifices for the country and achieve victory. His Excellency has pointed out the importance of the development of the police martyrs' fund through government care, noting that the wounded can continue in their services, and the government is ready to provide the suitable atmosphere for them in their work. Dr. Haider Al-Abadi has praised the martyrs and the wounded. Which the victory did achieve and liberate the lands by their sacrifices. His Excellency has reassured his confirmation that he won't retreat from the fight against corruption, and there is a comprehensive plan to combat it, pointing out the importance of eradicating corruption in the security services and that corruption must not affect the victory.